Speedbrain Husqvarna rider Joan Barreda showed once again he is among the very fastest Rally riders in the world by winning stage ten– his fourth stage win of the 2013 Dakar. The 29 year old Spaniard went head to head with KTM’s Cyril Despres throughout the 357km special with just one second separating them at way point five. 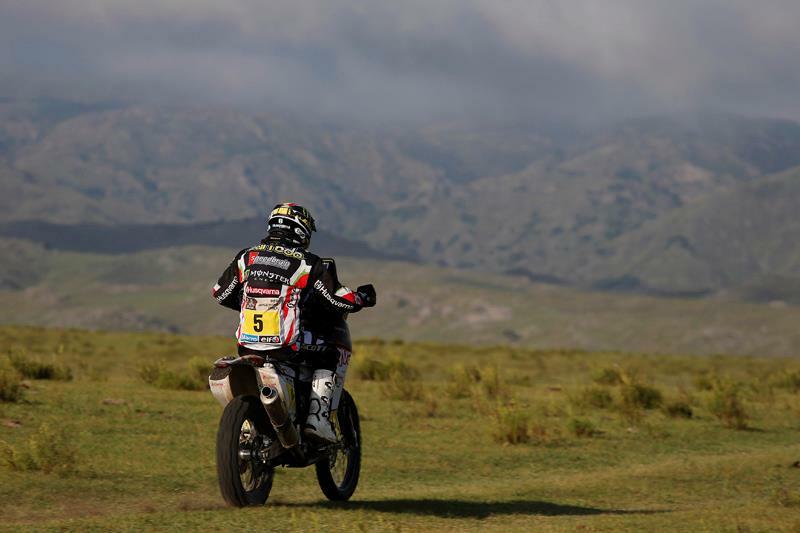 But as the stage went on Barreda was able to pull out slender advantage finally winning the stage by a slender 1m 15s. He said: “The day started with Cyril (Despres) opening the road. I thought I could catch him easily but he was quick. In the end, I caught up with him and we finished together. It was a lively stage and even fun before the refueling point; it was a rocky, narrow track, like in endurance racing and very varied in the end. Despres backed up his emphatic stage win yesterday to finish today’s stage in second place a result that see’s him move into the overall lead of the race by 1m 37s ahead of team-mate Ruben Faria. Paolo Goncalves made it two Speedbrain Husqvarna’s in the top three with a strong performance to finish ahead of Juan Pedro Garcia and American sensation Kurt Casseli. Chillean KTM rider Fransico Lopez could only manage the 12th fastest time on the stage, but sits third in the overall standings 13m 41s behind Despres.